Just that, just custard tarts. 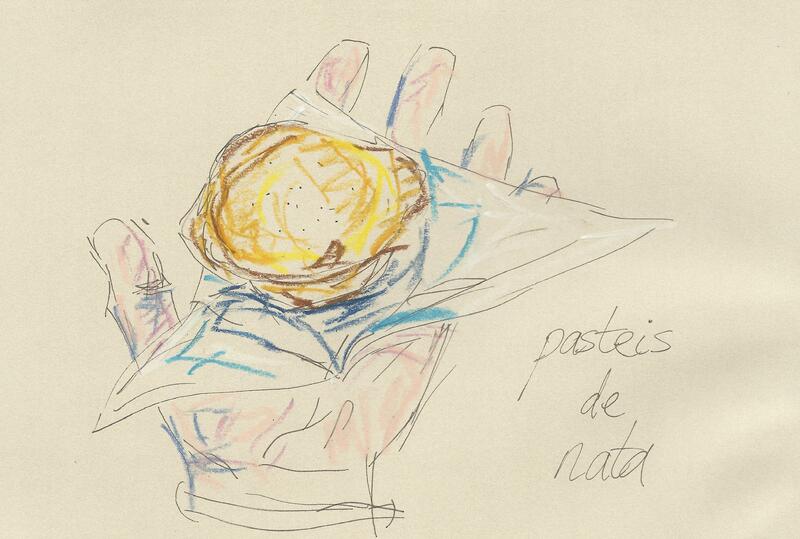 Ever since reading about the famous pasteis de Belem, I have wanted to go to Lisbon to try them. (I hear the city itself is quite nice too.) Now the pocket-sized Comme à Lisbonne is open in the Marais, I bypass my once beloved falafel, walk straight past the long queue for Pozzetto and order one tart. Then I keep walking, partly because there is only room for two at the tiny counter, partly because it is almost impossible not to order another straightaway. That’s all they make – a layered and incredibly buttery pastry shell that holds a barely set custard. They are always still warm, right from the oven. They make up to a thousand a day. No other flavours, but the option of a sprinkling of cinnamon on top. They do one thing and they do it superlatively well. Lisbon is a lovely city, the centre (in 2003) an easy size to walk around. Still many old terraces with pretty ceramic tiled fronts and washing strung across balconies. Every now and again you find yourself in a huge square, and always in the middle is a tall statue of a man on a horse. And yes, the custard tarts are absolutely delicious!